Don't you just LOVE that sentiment! 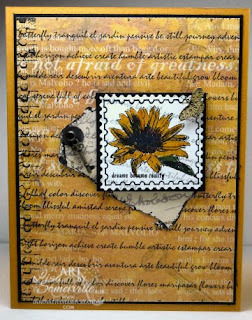 Today I'm sharing with you a peek at one of the new sets being released on Thursday from Innovative Stamp Creations, called Odd Findings. You'll find all the images and more on this new plate. Isn't the notebook paper edge cool! I stamped the background script in Grey on White card stock, stamped the postage in Black, then stamped the image in Black. Watercoloring the image with Adirondack Markers. I have a few of these markers and they work great for the TJNL Marker Watercoloring Technique too, so if you have them, give 'em a try. The sentiment is stamped in Black, the Butterfly stamped on a piece of the DSP, then popped up on a dimensional. To add to the already beautiful DSP, I stamped the Key image in Grey (you might not be able to see from the photo), and the Script in black, adding the Notebook image in black down the side. The image behind the focal image is also on this same plate, stamped on a piece of DSP then cut out. The Key and other findings as well as some other items will also be available from ISC on Thursday. Be sure to stop back on Thursday to see more creations with the August Release, and for a special discount code! So beautiful, Lisa! Love the key with the brad! Your flower is so pretty too! Beautiful job, Lisa! Love the way you did the faux postage and the script bg. Lisa, this is just gorgeous!!! I love the way you've added the flower to the card making it look like a stamp. Brilliant!!! Gorgeous job Lisa! Love the many little details you added! Lovely! Can't wait to see the entire sheet.